This is certainly one of the most anticipated new books to be published this year. The great Irish storyteller, Eoin Colfer, has developed a new series. W.A.R.P, which is an acronym for Witness Anonymous Relocation Programme, is the title of this new and exciting series. The Reluctant Assassin is the very first book - it is very different from any other story that Eoin has previously written. 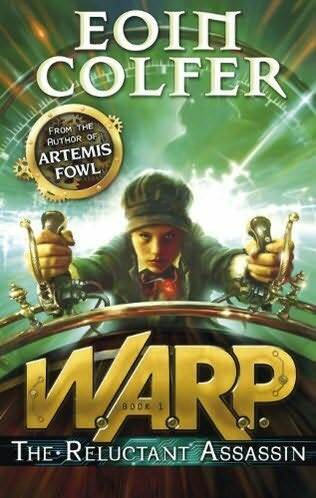 This book will certainly reach out to a new fan base and entice many more readers to enter the world of Eoin Colfer. There are some fantastic combinations in this story that will captivate the reader. It's a time travel adventure that's both steeped in conspiracy and intrigue. Partly set in Victorian London, but also within modern day London, the story weaves between the two eras. Riley, a Victorian boy, finds himself suddenly plucked from his own time and transported into the twenty-first century where he is accused of murder and on the run from his master. He finds help and friendship in Chevie, one of the youngest FBI agents, who is a very interesting and complex character. She's certainly one not to be trifled with at any cost! Assassin-for-hire, Albert Garrick, is brilliantly written. He is one of the best characters that I've read in a long time. He serves up a nice slice of terror, which adds to the dark and delicious backdrop of 19th century London. He is fantastic to follow adding an edgy chill to the story which was quite unexpected and certainly created a new dimension to Eoin's writing. Riley and Chevie find themselves having to stay one step ahead of Garrick. They need to try and stop him from returning to his own time with the knowledge and power that could change the world forever. As Riley and Chevie are pursued through time, a great portal of imagination is created - Oliver Twist meets H G Wells 'The Time Machine' with a little added sprinkling of The Matrix. This story is told by a great storyteller - Eoin has definitely rocketed up in my favorite author's list. I'm sure that you'll fall in love with this book. I was definitely hooked on so many different levels. The sinister world of Otto Malarkey's den is mesmerising to read. This Hidey-Hole of hell is a place filled with bad-blooded people - thieves, cut-throats, wastrels and lifelong blaggers (all elite members of The Battering Rams) who bet and fight their lives away. A new world has been created which is full of nasty characters written in a slightly disturbing and graphic nature. This is certainly one of my best reads so far this year. This story is full of Eoin's trademark wit. It is a swashbuckling high adventure which is full of magic. It will certainly transport you to the fantasy world that Eoin Colfer has brilliantly depicted. This is a book that will gain many a new follower and, perhaps, a slightly older reader. Packed full of action, original ideas and, with a laugh or two along the way, this book is a sure fire winner. I know that my followers will be itching to read this book and they will not be disappointed. Due to be published by Puffin from early April onwards, this new series delivers so much in the very first book. I liked this but was rather alarmed at the violence at the beginning. It seemed a bit much, although I liked the rest of the book.